Exogenous melatonin reportedly induces drowsiness and sleep and may ameliorate sleep disturbances, including the nocturnal awakenings associated with old age. Daytime administration of exogenous melatonin (when it is not present endogenously) promotes sleep in humans and results in sleeplike brain activity patterns at specific areas such as the precuneus and hippocampus. 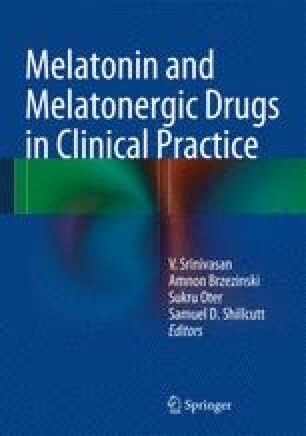 However, existing studies on the hypnotic efficacy of melatonin have been highly heterogeneous in regard to inclusion and exclusion criteria, measures to evaluate insomnia, doses of the medication, and routes of administration. The inconsistent reports about the effectiveness of exogenous melatonin in the treatment of insomnia brought about the development of more potent melatonin analogs with prolonged effects and the design of slow-release melatonin preparations. The melatonergic receptor ramelteon is a selective melatonin-1 (MT1) and melatonin-2 (MT2) receptor agonist with negligible affinity for other neuronal receptors, including gamma-aminobutyric acid and benzodiazepine receptors. It was found effective in increasing total sleep time and sleep efficiency as well as in reducing sleep latency, in insomnia patients. The melatonergic antidepressant agomelatine, displaying potent MT1 and MT2 melatonergic agonism and relatively weak serotonin 5-HT2C receptor antagonism, reportedly is effective in the treatment of depression-associated insomnia. A review of the currently available evidence regarding the effects of these compounds on sleep quality is presented in this chapter.